On October 1st, 2011, almost a month after we all thought the soaring season had ended for the year, at 11:40 AM Kenny phones me at my home in Vacaville, Ca – some 50 miles south of the glider port, and advises me there are beautiful cu clouds at 12,000 ft all along the Mendocino Mountains. Five minutes later, I receive a phone call from my wife Linda and she suggests that I go soaring, since the clouds look so nice from her office window in Sacramento. With that, I don’t even waste time looking at a satellite photo, I just start throwing stuff into the car. 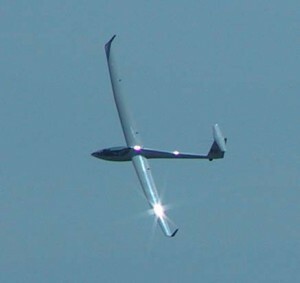 Rick Ogden was launching as I arrived at William’s, but I still had to assemble my glider. After Kenny returned from that tow, he gave me some help pushing my glider to the launch point and off we went. Rick Indrebo had launched from Crazy Creek about 40 minutes earlier and was already past Goat Mtn and heading north towards Lake Shasta, maybe even Minden. I released at 4,600 ft on the ridge east of Goat. The cloud above me was massive – a good mile wide and at least four miles north to south. Feeling extremely confident, I circled once to slow down, hoping I would climb, and decided to select Letz Lake as my starting point. I then headed north, figuring I’d contact lift any second. Then, for the next 15 minute, I humbly worked a half knot thermal from tree top level on the south side of Snow Mountain struggling to climb. Thanks, I needed that. File photo of Peter Kelly “PK” by Milt Hare. That thermal on the southern flank of Snow Mtn eventually turned into a steady 900 feet per minute rate of climb, and I rode it up to 13,000 feet. I quickly moved northward to Eagle Peak. As I approached my second thermal, I heard Rick Indrebo crossing Redding eastbound, Paul Kellas was at T-15, and Rick Ogden was crossing T-16 northbound. Jim Indrebo, flying EJ, his new DG-505 was climbing above me near the top of the thermal there at Eagle Peak. By the time I had climbed to 15,000, EJ was already headed southbound for Crazy Creek. It was already past 2 PM. I’d never catch Rick Indrebo if I went north. I needed to get maximum altitude out of this this second thermal and started to consider crossing directly across the Sacramento Valley. I did a few quick calculations, and figured I could cut across the valley, and intercept Rick as he turned southward. Rick had already said he was going to try for Minden. I crossed Interstate 5 just south of Red Bluff at 12,000, and finally arrived on the east side of the Sacramento Valley some 60 miles later, under scattered weak cu, and down to 8,000 ft. I was now less than 40 miles from Chester Airport, near Lake Almanor. But with the Sierra Crest in front of me and Lake Almanor being at an elevation of 4,500 ft, I still had a long ways to go. If I hadn’t made that lift, I would have been gliding back into the Sacramento Valley to the southwest to the fields just north of Chico. When I left Eagle Peak, Rick was probably somewhere near Redding. He was traveling at high speed. In this graphic, created by Jim Darke, my flight trace is in red, and Rick’s flight trace is in blue. I arrived on the west side of Chester as Rick was approaching it from the northwest. I headed south, taking some turns in weak thermals north and east of Quincy, and cruised over Sierraville, and then over Truckee. The lift wasn’t nearly as strong up in the Sierras as it was in the lowlands. As I passed overhead Truckee I could see there were only three glider trailers on the ramp. 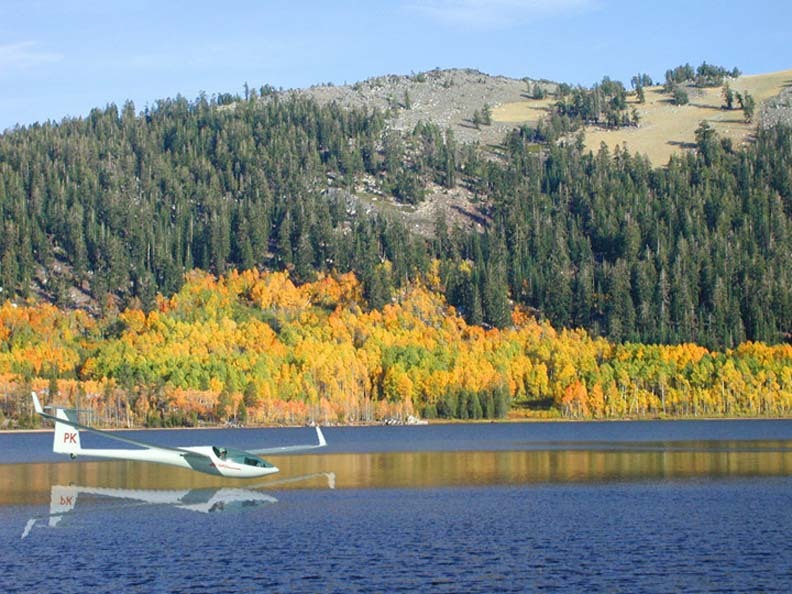 Since it was already October 1st, Truckee Soaring Operations had closed for season – a bit ironic that they were closed, considering that I was currently cruising overhead, enroute to Minden. After leaving the shore line of Lake Tahoe at King’s Beach, I entered the state of Nevada. There is a beautiful small lake along the crest of the ridge on the east side of Lake Tahoe, called Marlett Lake. Although I had been there before, I didn’t get to see it on this particular flight. However, this photo of the lake by Jennifer illustrates the fall colors, already showing in the Sierra Nevada Mountains. Photo (and Photoshop work) by Jennifer Ware. After Kings Beach on the north shore, I crossed Highway 50 at Spooner Summit and picked up my speed as I dove into the Carson Valley for my landing at Minden-Tahoe Airport, Nv. 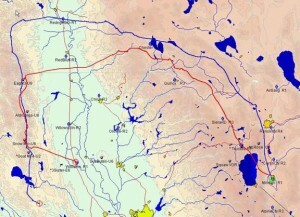 Meanwhile Rick had passed north of Chester, and took a course well east of my track passing near Susanville, Herlong, Beckworth, and Reno, landing shortly behind me at the Minden-Tahoe Airport. Rick had taken the long way, and must have had some very high ground speeds on his way up the hill. The next day, Rick’s Dad, Jim, flew up from Crazy Creek and Rick was towed back down the hill to their gliderport near Clear Lake. I waited for the lift to kick off, and with help and encouragement from my friend Jim Herd, headed for the Pine Nuts, looking for a climb. As typically happens, I could not see a path of lift that would take me to the north, so I went to the south end of the Pine Nut Mountains and then west to the south end of Lake Tahoe. Lift was good and I was able to make good time over South Shore and up along the west shore of Tahoe. At the north end, Jim H. headed back south and I proceeded alone in a northward direction, hoping I could achieve enough height to glide off the crest of the Sierras and make it back to Williams. Note: This article was moved from the blog Section to the web page section of the VSA web site, some four years after it was first posted. Recent edits have been added.